Prime travel season is around the corner. Rest assured, it’s possible to stay healthy while you’re on vacation. With the right mindset, you can maintain healthy eating habits while exploring unfamiliar places. Here are some of our favorite tips and tricks for staying healthy while on the road. Try some native fruits and vegetables that aren’t available where you live. If you’re traveling to a coastal region, take advantage of the abundance of fresh seafood dishes. Take a stroll around the local farmer’s market and bring some produce back to your hotel room or rented apartment (it helps if you’ve rented a space with a kitchen). A farmers’ market in Ubud. It was so much fun sampling the local fruits and shopping for veggies. So much produce I never knew existed! Eating at restaurants every day can make it hard to get enough veggies in your diet. However, most restaurants have fresh vegetables on hand, even if they don’t list them on the menu. You can ask for a side of whatever fresh veggies they have on hand, or ask them to add more veggies to the dish you’re ordering. You’ll be surprised to find that most restaurants will be accommodating. Save room in your suitcase for some healthy portable snacks. These will come in handy when you’re on your way to your destination. Healthy snacks like nuts, olives, protein bars and grass-fed beef jerky keep well and are far better options than what you’d find at an airport or convenience store. And since you’ll be spending less money on snack foods, you’ll have more room in your budget for local restaurants where you can have an authentic and cultural culinary experience. If you’re traveling to a place where the water is safe to drink, bring your water bottle. Staying hydrated is important, especially during hot summer months. Proper hydration can also help reduce jet lag symptoms and help you adjust to a new time zone more easily. You’ll also save money by not buying bottled water, and reusable bottles are more environmentally friendly. We found this incredible yoga studio, Yoga Garage, in Florence, Italy. It used to be a church, then a library, and now a place to practice yoga. There are countless ways to stay active while you’re traveling. The best way to get to know a new place is to explore it on foot. Grab a travel book and chances are, it will have guided walking tour suggestions that will take you to popular sites, shops and restaurants. You can also schedule outdoor activities like hiking, cycling, kayaking and canyoning. Staying active can also help keep your immune system strong. Working out the morning after you arrive can also help reset your circadian rhythm, so you don’t feel quite as much jet lag. 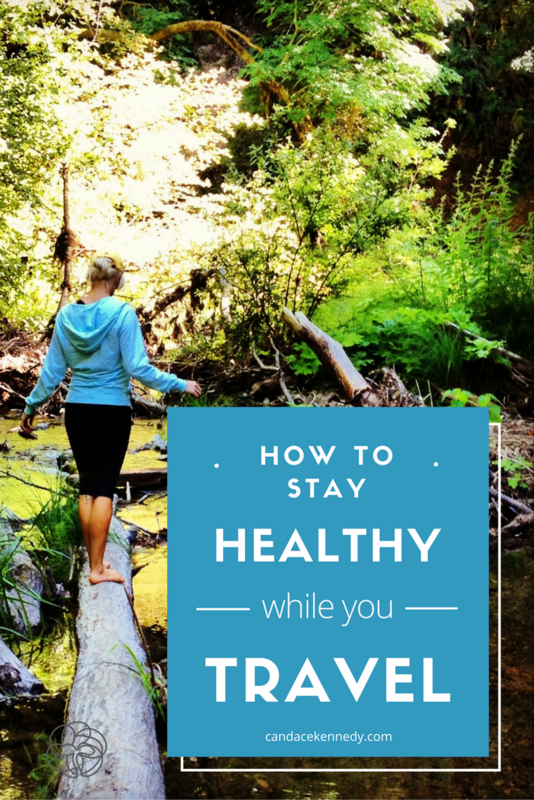 How do you stay healthy while you travel? Share your tips in the comments below. This article was originally posted on the Zipongo blog. You can read the original article here and check out some more of Zipongo’s recipes and content.